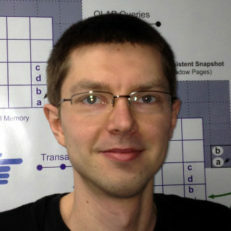 Viktor Leis is a postdoctoral researcher at the Technical University of Munich. He does research on core database topics, including query processing, concurrency control, index structures, storage, and query optimization. Viktor’s 2016 dissertation, which was done in the context of the main-memory database system HyPer, received the bi-annual dissertation award of the German-speaking database community (DBIS). He also received the best paper award at ICDE 2014 for his work on hardware transactional memory.